Its fascinating to experience yoga through the aura of 3. One of the stilled intimacies that took place during my first entrance into the Mudra temple. I already detailed my experience in meeting the spiritual warriors, and gatekeepers, of the space. Yet, it was entry into the temple, where I participated; experiencing the ancient feminine rituals of healing–and the sacred feminine of God. . .herself. I was the third force that entered, in the finality of the trinity. Guided together with our mats, symbolizing Universal focal points, the priestess presiding over the session, continued into a journey’s hour; to intertwine harmony and balance in the sacred art of movement. 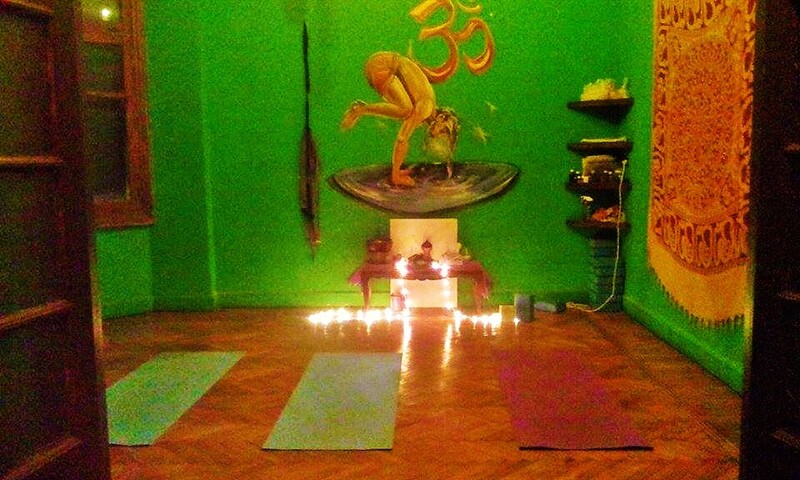 In the yoga session with Sherine, time was eternal. The beginning and end had married. Was a while since I physically worked movement through my body. A plague of stiffness entrapping itself within her. . .for a while. Yet, to be in the protective energy of other feminine beings, was comfort of cotton’s softness. It was as if the Trinity was floating throughout the galaxy. Allowing our bodies to be moved, and pulled; through whatever direction the tune of her beat enshrined. Imagining ourselves to be free of the burden of rigid control. Being guided by the priestess, led to the synchronicity of the women of 3. Their images becoming in sync with each other. An intertwining of 3 Spirits, as each woman struggled, and persevered, through this path of completion. I, myself, felt warmth melt away those rigid limitations, within the interior of my existence. It’s no coincidence that symbols within the temple spacing reflected the Trinity for 3 feminine Beings of that particular, hourly ritual. Moving around to ensure that each Trinity maiden was secure, and accurate in the practice of Universal movement, the priestess invoked touch, to re-align us, whenever we fell off balance. Or, outside of our subconscious Circle. Upon seeing the priestess, my visions of her, saw her as a version of the Venus of Willendorf-symbolic artifacts of the Goddess, herself. Her full-figured shape, short, curly hair, reminded me that we were in a space of abundance. Energy that was nourishing, restoring, and enriched one’s journey. The style and shape of her hair was a reminder of all women’s connection to Black mother. I, myself, felt she was a Spiritual twin of mine. Again, reminding me that my dark existence was safe in her presence. Subconsciously, her presence was silent laughter towards the idiocy of false and unhealthy perceptions forced upon women. That energy, which keeps us in a state of fear. Another observation, which could not go unnoticed, were the use of blocks. Similar to the mats, they were tools of alignment between the heavens and Earth. Music of the time spoke the beat of dance for that auspicious trance of Universal love. Until next time, when the trinity, restores her gaze for treasured souls. Daring to create, and fulfill balance for the memory of time.